For the past four years, it has cost the United States Mint more than face value to produce the penny and the nickel. The cost of the coins was recently 1.62 cents to produce each penny and 5.79 cents to produce each nickel. The United States Mint produces and issues coins for circulation, which are distributed through the Federal Reserve Banks in quantities needed to replenish inventories and meet the needs of commerce. The Mint recognizes revenue based on the face value of coins as they are shipped. Seigniorage arises from the difference between the face value and the cost to manufacture and distribute the coins. Amounts earned through seigniorage are transferred to the United States Treasury General Fund. Since 2006, it has cost more than face value to produce the cent and nickel due to the increased costs of base metals. The current composition of the cent is 2.5% copper and 97.5% zinc. The current composition of the nickel is 75% copper and 25% nickel. Although producing and distributing cents and nickels has generated losses each year, the gains from other denominations more than make up for the losses. In the most recent fiscal year, the US Mint lost a combined 22 million on production of the cent and nickel. The gains from other denominations more than made up for this amount. Last year, the United States Mint shipped a total of $777.6 million in circulating coins, which earned $427.8 million in seigniorage. 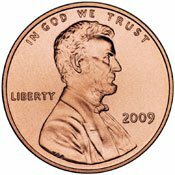 If each penny cost the US 1.62 cents to make in 2009, and the Mint produced 2.3 billion pennies that year, the seigniorage should equal -37 million, not -19 million. You are quoting annual production figures, the article is citing fiscal year figures. The US Mint’s fiscal year ends September 30. The gov. needs to institute a penny buy back program. Most pennies end up in large jars in the attic or garage. Give $1.10 for 100 pennies. Kids would learn about investing and the gov. would save alot of money. Do this through banks and most people would spend the extra money. Good for everyone. It seems, after hearing reports of investors buying 20 million nickels. (see: Colbert report 02/01/11) That their needs to be a law protecting Fed. deficit from hoarding any coins with a negative Seigniorage. Maybe something like, A. person buying coins needs to prove they have a cash drawer, i.e. business that uses coins. And all coin purchases of coins minted at a loss are limited to 1,000 per cashier shift, per day. And any subsequent 1,000 per orders of coins, that are not circulated as cash change results in fines to the hoarders. It just really bugs me because the Fed. bank really only continues to produce the small coins as a service to working class people. Wealthy people don’t need to hoard small change, and this is just another way, these investors are stealing from all of us. No offense but what you are proposing is stupid, fascist and unenforceable. The problem is that the government is printing so much money that inflation is shrinking the value of the dollar. So much so that since the last silver quarters and dimes were circulated as money in 1964 they have gone up in value 24X when compared to the US Dollar. So I hoard metal shamelessly and declare it proudly! In fact, shame on THEM for stealing our wealth with an unconscionable, and invisible inflation tax which has the worst impact on the poor and uneducated. Shame on them for violating the Constitution which mandates only the use of gold and silver coinage as money. Shame on them for giving the power to produce money to a PRIVATE (for profit) bank known as the federal reserve. The offenders here aren’t American Citizens. The offenders are the people running the government and the federal reserve!!! So Uva, instead of proposing more restrictions on the American citizens, why are you not proposing a return to sound money in the form of gold and silver? Without gold and silver money the only way to protect yourself from government theft via deliberate inflation is to buy metal or other tangible assets. If the government wants to subsidize my purchase of copper and nickel by making then into a coin and declaring by FIAT that is MUST be worth 5 cents, then shame on them. Back up the truck and buy all you can while they are on sale! Anyone can buy as many nickels as they want right now because it is legal currency. I called my bank and ordered $500 worth of nickels. They arrived three days later in rolls which are in boxes of $100 face value. Sure, the bankers thought I was crazy because they hadn’t heard of this subject yet, but they were polite and even helped me carry the 5 boxes (weighing 22lbs each) to me car. Why hold paper worth nothing when you can hold nickels worth between 7.5-9.5 cents each and only cost 5 cents to buy??? When the mint starts making them out of a less valuable metal we will reap the benefits by being able to sell our pre-2012 (or whenever it happens) nickels on the open market for the value of their metal content, just like we can with pre-65 coins. It’s the best “investment” opportunity in a lifetime (since 1964 when the same thing happened with silver coins). The “working man” should be hoarding every nickel he can find. Uva, seriously? Take a lesson from Pete. The restrictions you propose can do nothing but ultimately restrict free trade and economic growth. The fact that people only want US coinage for their metal value is clear evidence that our currency is in trouble. To hell with face value; all I want to know is what’s the silver or copper content. The only reason they stopped using silver and gold to mint US coins is because doing so made it impossible to continue the charade. I say we take back the wealth before they start making our money out of plastic. Bastards. And while we’re at it, let’s all pay each other in cash, gold, silver, copper or any other thing worth bartering and stop using checks, credit/debit cards, or any form of payment that leaves records for the IRS to follow. How about we live within our means and not enslave ourselves with debt so that we “need” the government to bail us out. And nationalized health care…at what point do we wake up and see WE ARE NOT FREE! How about stopping the production of nickels and pennies and resetting the value of existing pennies at 2and a half cents each? That would encourage everyone to empty those jars and bureau draws of their pennies and take advantage of the 150% profit of each penny used. The biggest problems would be had by vending machines and businesses that price things at 99cents or any other endeavor that requires rounding to the nearest PENNY.